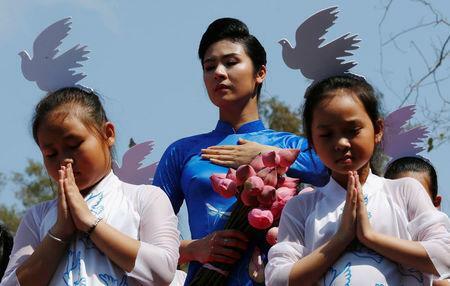 QUANG NGAI, Vietnam (Reuters) - Vietnam marked 50 years since the My Lai massacre on Friday in a memorial ceremony at the site of the killings that was attended by survivors of the massacre, their families, and around 60 U.S. Vietnam War veterans and anti-war activists. American soldiers killed 504 people on March 16, 1968, in Son My, a collection of hamlets between the central Vietnamese coast and a ridge of misty mountains, in an incident known in the West as the My Lai Massacre. "After peace was restored in the country, the people of Son My overcame pain with forgiveness and opened their arms to sincerely welcome U.S. veterans here as a place of pilgrimage, a place to face the truth, face themselves and find peace of mind in a receiving land," Dang Ngoc Dung, deputy chairman of the Quang Ngai Province People's Committee, said at the event. Survivors of the massacre told Reuters of the darkness and silence in the hours after the killings as they struggled to bury the dead in fear that the Americans might attack again. It was the worst recorded U.S. war crime committed in Vietnam but the ceremony at the site, now a memorial to the victims, was relatively low key amid warming ties between Washington and Hanoi. The ceremony fell just a week after a landmark visit by a U.S. aircraft carrier to the nearby port city of Danang, evidence of warming ties between the former foes. A delegation of U.S. Vietnam War veterans and anti-war activists met Dung and other Vietnamese officials privately in a small function room after the ceremony. The veterans and activists said they were preparing to send a letter, on behalf of the United States, apologizing for the massacre. "In just a short time, more than 600 people have signed it," said Chuck Searcy, Vice President of Veterans for Peace. "It expresses the remorse, regret and sorrow of Americans and our shared responsibility for what happened here," he said.